T had tried this restaurant several times, and I had only finally gone yesterday. I started off with the Agua Bendito, which consisted of Bombay gin (for which I substituted for Hendrick’s), cucumber, lemon syrup and mint. An obviously fresh drink made even fresher with the Hendricks. It was a great way to hype myself up for summertime. 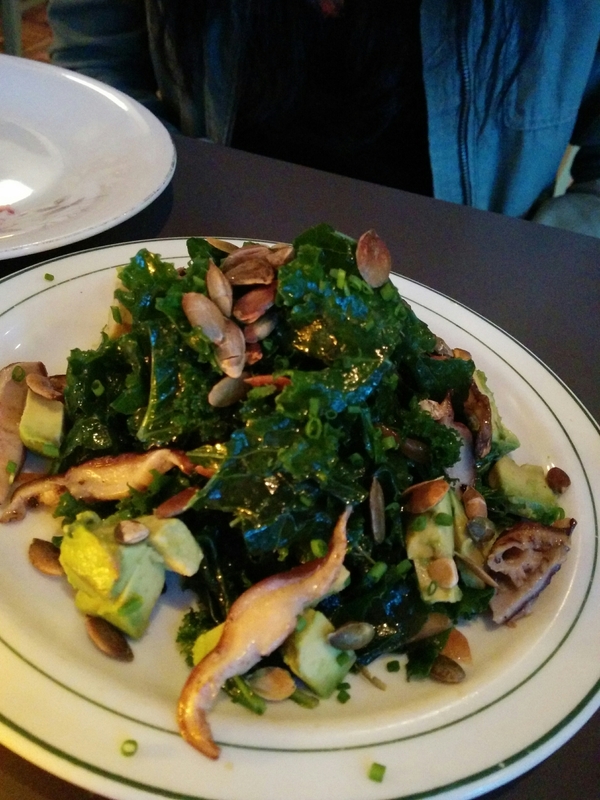 My friend M and I shared two appetizers, the Kale and avocado salad with shiitake and sunflower seeds, and the leek fritatas that came with a zesty yoghurt pairing. The salad was quite interesting with the shiitake mushrooms, giving it a very earthy taste. An unlikely addition was the avocado, which changed up the texture quite a bit along with the sunflower seeds. It was definitely a more wintery type of dish, but I enjoyed it nonetheless. 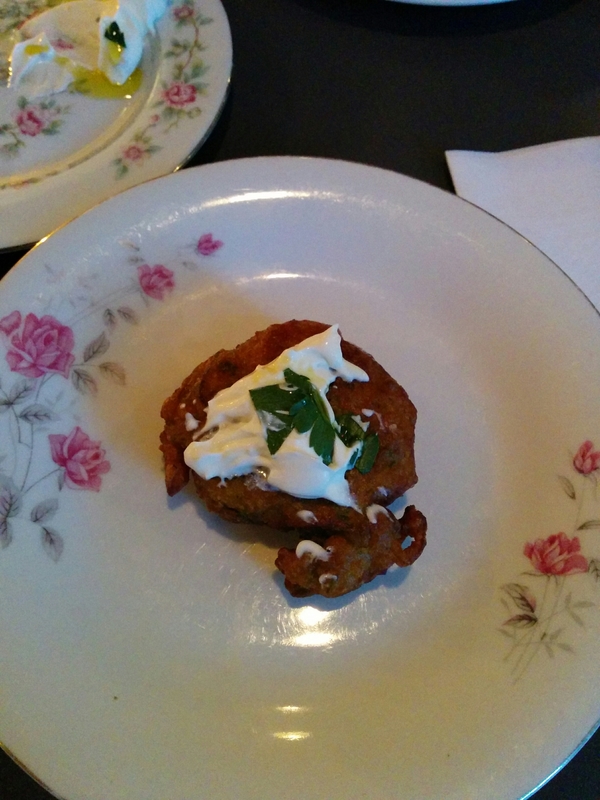 As for the leek fritatas, the inside was a blend of leek and some sort of carby mixture, as with most fritatas. The leek was quite nice and added a great flavour to it. The batter was a little on the oily side, so I would have liked to see them perhaps lay it on some parchment paper before serving. The yoghurt dip went beautifully with the very oily fritata, the tartness of it relieving the greasy mouth feel. 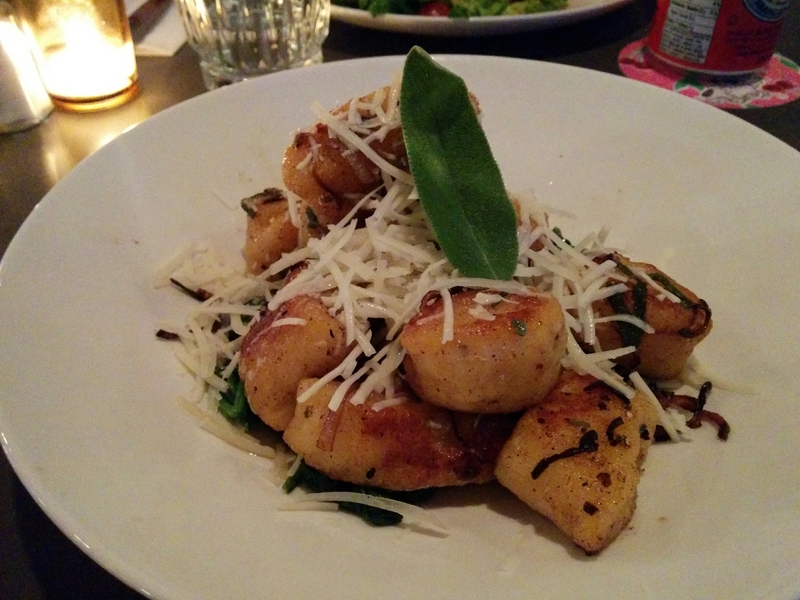 For my main, I ordered the butternut squash gnocchi served on a bed of Asian Spinach sautéed in garlic. I thought this dish lacked an oomph. Perhaps it’s because I’m not a big cheese fan, so the cheese didn’t really cut it for me, but I found the gnocchi to be quite bland. It was also very overwhelming because I was only able to finish half of this. It’ll definitely fill you up if you’re looking for an (un)healthy (several) serving of carbs! 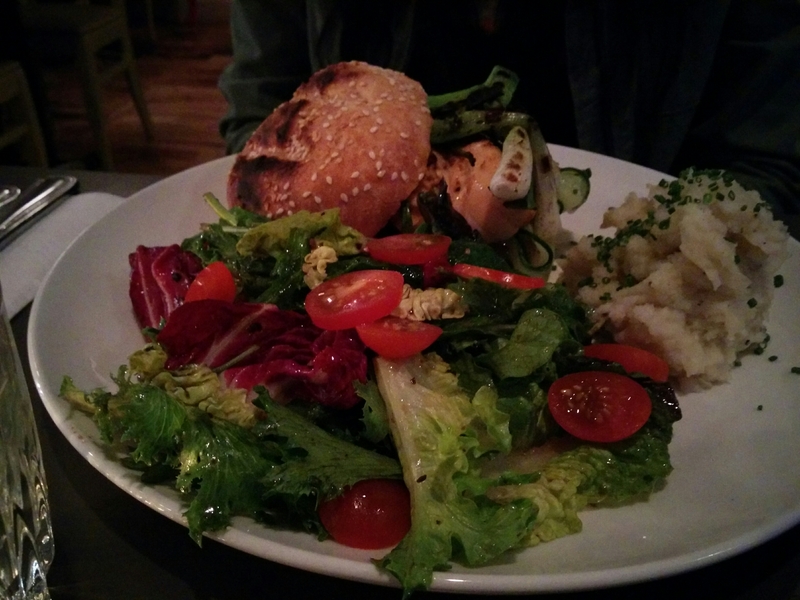 M got the salmon burger, which looked absolutely delicious. The burger was topped off with green onion and sriracha sauce, among many others. The salmon was quite thick and was cooked so that the juices were all retained in the center. M said this was absolutely delicious, but again she couldn’t finish it. She commented that the mashed potatoes were more healthy (not a lot of butter), but tasted a little bland. The salad on the side was an excellent portion (my dietitian self speaking), and was a great fresh pairing to the salmon burger. Even though our stomachs were exploding, we heard the options for dessert anyway. And I’m glad we did! 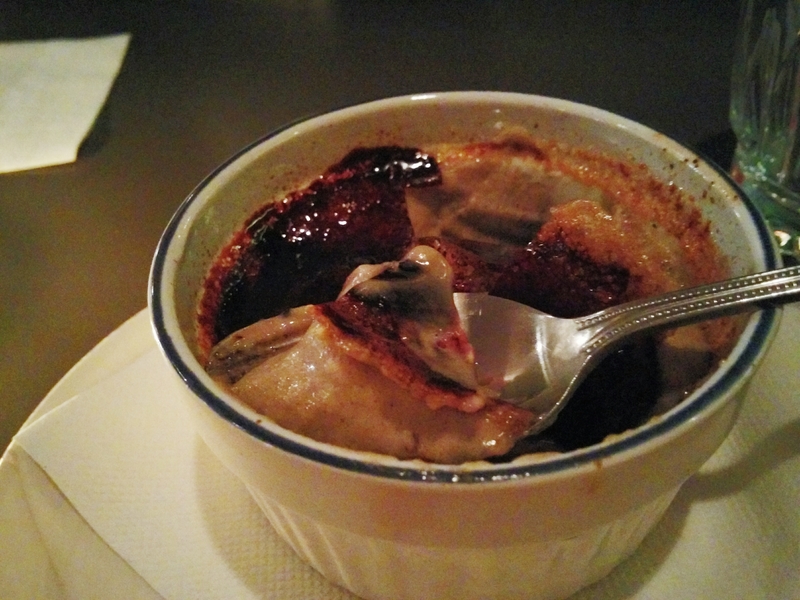 They had a black sesame crème brulée, which we only needed to glance at each other to know we both wanted to share it. The creme was of a very smooth yet rich texture, with the ground sesame paste sitting at the bottom. The combination was quite nice, and it wasn’t too sweet or too bitter. I did think they could have amped up the black sesame paste a little bit, but perhaps they were being conservative for some of the patrons who weren’t too used to the strong and fragrant black sesame taste. We thought the sugar layer at the top was too burnt and too thick, so I ended up just eating what’s underneath. Overall, I think this restaurant has some very interesting and uncommon dishes. They’re not extremely unique or innovative, but definitely has a good variety of palette and takes from different cultures. It’s hard to pinpoint what type of cuisine they do, but definitely a mix of asian, european and american. The execution of the food could be done a little better, with a better balance of flavours. But I did appreciate the fact that they only had two cooks, a very small and open kitchen, with a fairly large variety and number of dishes to offer. The atmosphere is extremely relaxed and perfect for a Friday after a full (or maybe just 4 days) week of work. 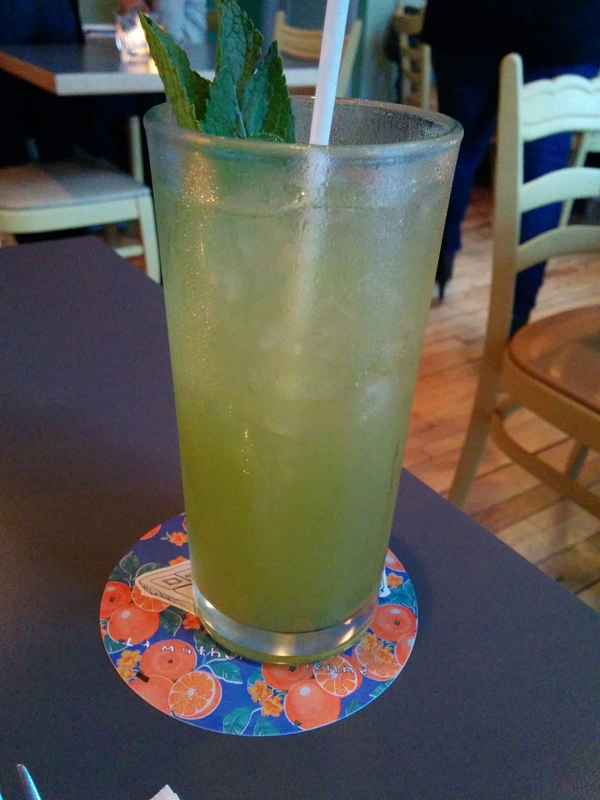 The next time I come, I will definitely be asking for an Elderflower collins, as I had spotted that they had St. Germain (and obviously Hendrick’s) as I finished my drink. I was a little bummed that I had not seen this earlier, but it just gives me another reason to come back! Starting work at the hospital this past week, it has been tough. So some of my friends and I decided to catch each other up on our exciting new experiences by going to grab some food (and drinks of course) at an izakaya very close to where we live. Biiru was a place that we’ve all seen recently, and since it is still relatively new, there wasn’t much information about it. From the pictures and the menu, we decided it was worth trying. The décor is a love-hate for me. I love the vibe it gave, from the wood tables to the bouncy stools at several of the tables. 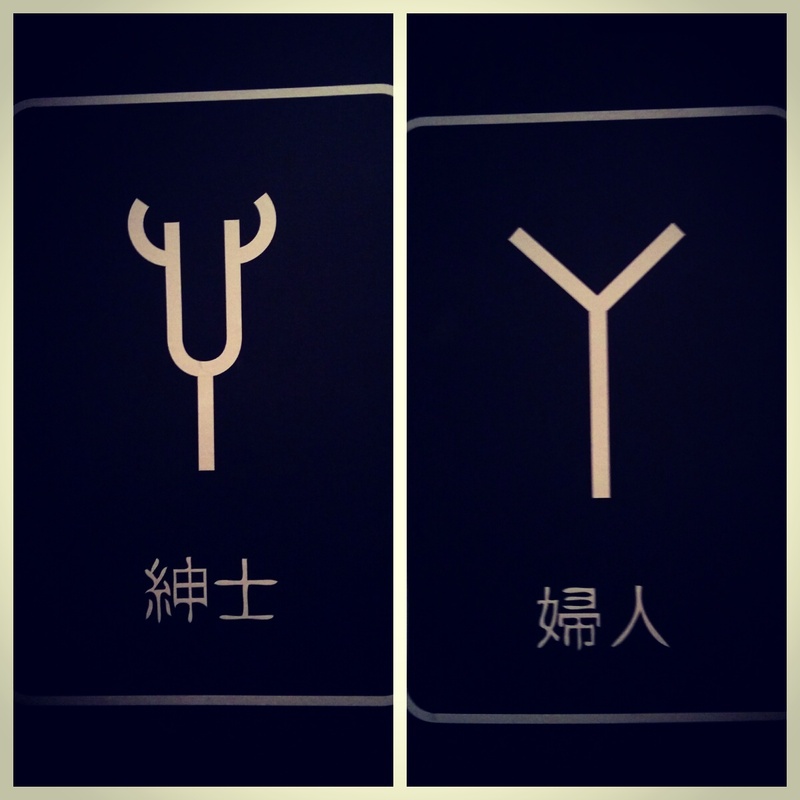 I love that they had many different types of wall décor, and I absolutely loved their washroom signs. However, I would’ve liked to see cleaner typography when it came to the katakana and hiragana on the walls and on the back of the chairs. I didn’t like how it wasn’t clean, and were literally painted on by hand. Perhaps that was the style they were going for, but it just looked amateur and sloppy to me. We were seated at the bar since there were no other spots available (even though the whole time we were there, there in fact was a table open…). It was obviously difficult to talk to everyone, but worked out well in terms of sharing food. My friend and I shared four dishes: their Japadog, Mushroom Okonomiyaki, Chirashi, and a seafood tempura. Starting off with the Japadog, it came in an Asian dinner roll, the ones that are glazed and are very buttery and sweet inside. My friend hated this type of bread (but I quite enjoy it). The “dog” was a handmade shrimp and porc sausage which turned out quite well. I loved that it wasn’t perfectly rounded, and looked house-made. The flavouring was okay, not too strong or bland. The sauce was a mix of mayo and generic teriyaki-type sauce, giving a creamy yet sweet taste to the dog. It was also garnished with a good amount of purple cabbage. Overall, it was okay for $7, with them being lazy with the bread, but picked it up with the sausage. 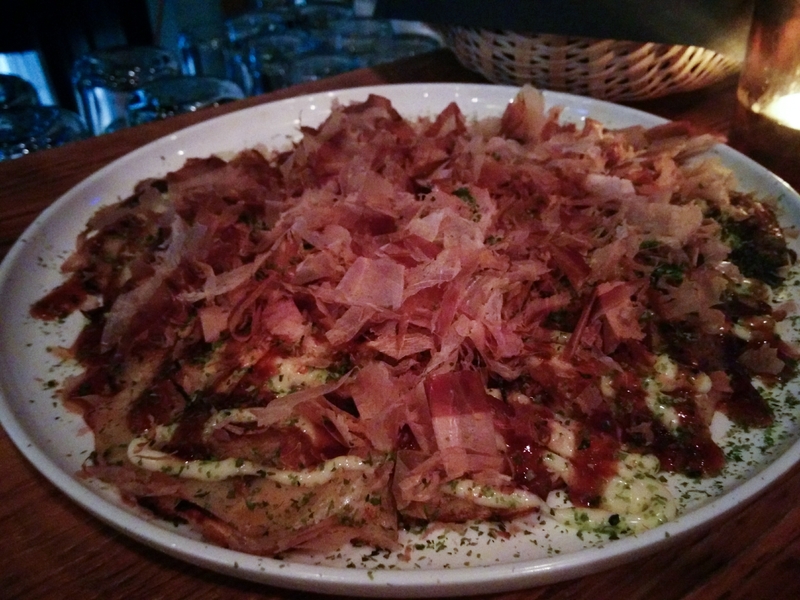 The Mushroom Okonomiyaki was probably the best of the bunch. Although it was priced at $13, I did think that this was probably the most authentic (while being innovative) compared to the other dishes. There was a very generous amount of bonito flakes, which I loved. The dough was quite good, and it retained that slight uncooked texture that I absolutely love (not everyone’s type of thing). The mushrooms were not incredibly tasty or rich, but complimented well with the very small amount of truffle oil they added. It was simple, tasty and overall a good filling dish. The Chirashi was absolutely awful and just plain sad. The only raw fish included was 3 sad pieces of leftover sashimi, not cut properly, and of bad quality. The rice was done quite well, and I did like the lettuce they added to give a freshness. 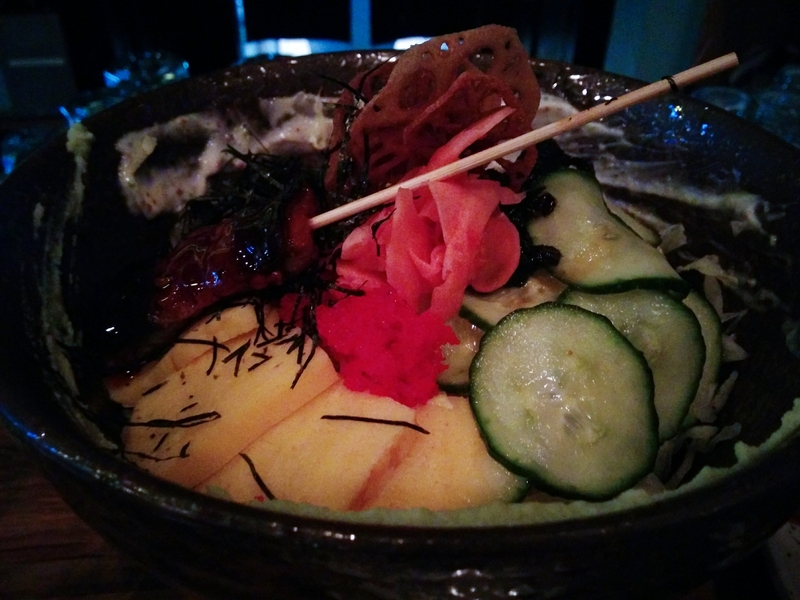 But the rest that was on the “chirashi” were cucumbers, egg and one piece of eel that was probably 1/8th of your palm. Sad and pathetic, I wish I never ordered it. Lastly the tempura was also a huge fail. The batter was awful, the selection was also awful. We didn’t go for the celery tempura, because that’s just silly. They did not have any type of crunch to it, and were a little too damp. When you pick up the shrimp, tiny pieces didn’t crumble off, and fell limp in my chopsticks. The sauce was some strange, non-traditional sauce as well. Priced at $12, I wasted my money on this one. 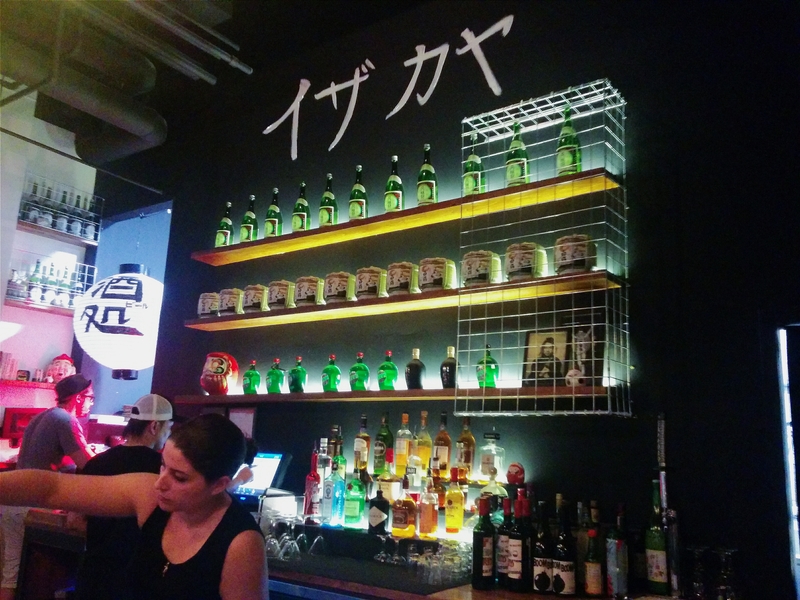 My overall impression of the place is just a mediocre, caucasion-fied izakaya. 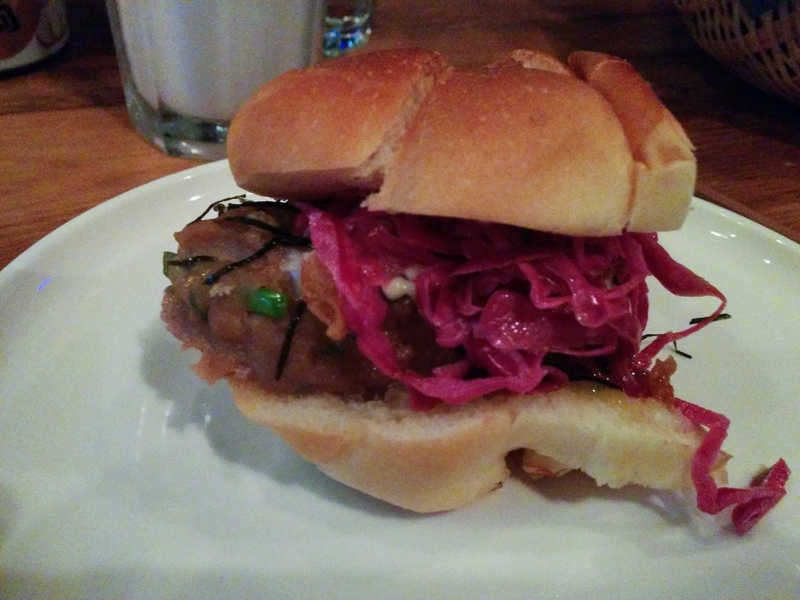 I was a little surprised at the Japadog implementation, but the execution didn’t exceed or meet my expectations. It was by no means any comparison to Vancouver or Japan’s Japadogs. The service was mediocre, given that we were given the bar when there was a table available the whole time we were there (probably a no-show reservation). The cocktails were weak and nasty. 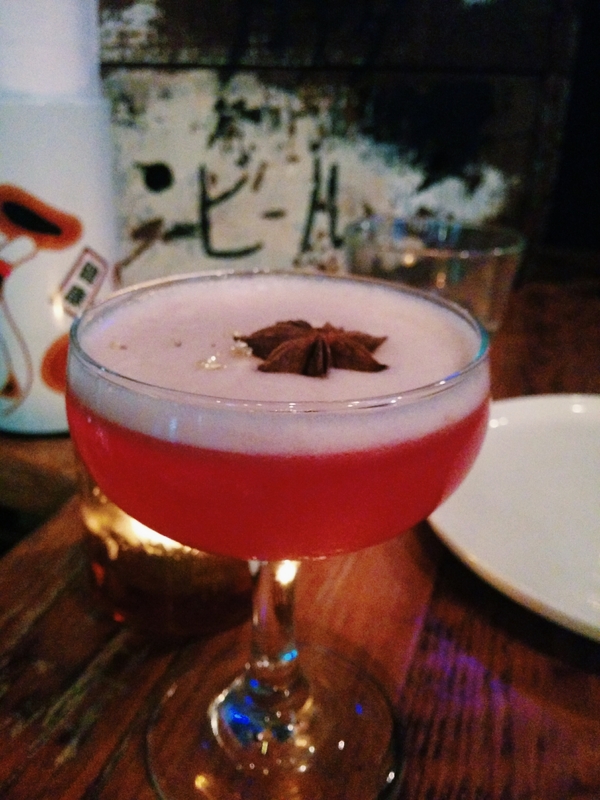 They tried to incorporate Japanese ingredients with some traditional North American bar ingredients…but it really didn’t turn out well. You should just stick to beer here. It was a good night solely because the conversations were good.